While Tom Hanks has officially taken the title of the "Most Likable Man in Hollywood," he better watch his back. With Steve Carell's latest career choices, he is slowly creeping in there as not only one of America's favorite comedic actors but now as one of our most interesting dramatic actors. If you're not yet sold, just wait until you read his reaction upon receiving an Oscar nomination for his latest role in Bennett Miller's Foxcatcher. I was up at 5:30 with a cup of coffee sitting downstairs in the darkness. And my wife, I didn't know she had woken up too, but she was watching in our bedroom. When my name was announced, I ran up the stairs to tell her as she was running downstairs. So we met at the top of the stairs, and were just jumping up and down for about 10 minutes. I'll just never forget that. It's a very unique moment and just such a supremely happy one. And to share that with my wife, and to have her be so supportive and be a part of it, it's just really fun and exciting. It's always great to see such a big persona have such a down-to-earth response like that of Carell. Not only that, but it sounds like his sharing the moment with his wife of 20 years (a Hollywood rarity) is also something the actor holds dearly as well. I don't want to be the Debbie-Downer here but I'm pretty sure Michael Keaton has the Best Actor Oscar on lockdown, thanks to his amazing comeback performance in Birdman but I'd still be thrilled if Carell pulled off the win for his performance as John du Pont in Foxcatcher, as he did a phenomenal job as the eccentric billionaire. Carell began his rise to fame through his role as Andy in The 40-Year-Old Virgin but really became a household name with his character Michael Scott on NBC's The Office. 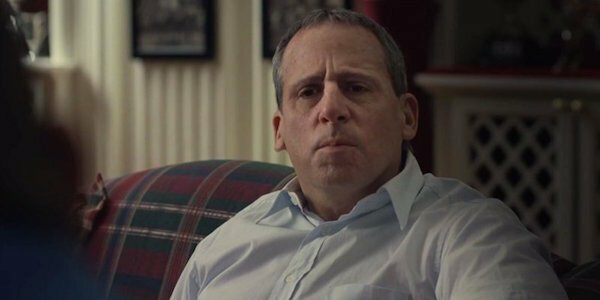 Though that's obviously a very strong comedic past, his performance in Foxcatcher suggests that he has a lot to offer the dramatic world. We can't wait to see how he follows up his Oscar-nominated turn.